When you're first starting a company, developing employee benefits isn't likely at the top of your list of things to do. As your business grows, however, you're going to want to attract the best employees, which can be difficult when you can't afford to pay the highest salaries or provide some of the spectacular benefits that larger, established companies are able to offer. So how do you create a compelling work environment without breaking the bank? 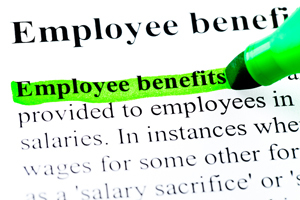 Luckily, there are a number of popular benefits that employees love, many of which are low-cost and sometimes free! In the long run, providing even a few seemingly simple benefits will attract loyal employees who will want to work for your company for years to come. When you're deciding which benefits to offer your staff, consider the company's culture, your employees goals and needs, and the impact these perks will have on your business as a whole. Car care: Arrange for a car service to come to your office on specified days to take care of your employees' oil changes or wash and detail their cars while they're working. Casual dress code: This is easy to implement and costs your company nothing. However, allowing your employees to wear jeans to work is considered a major perk. Not only do employees feel more relaxed (thus more efficient and focused), it can also ease the financial stress of having to purchase one more expensive work-appropriate outfit. Commuter benefits: Getting to work each day can be quite costly. By providing employees with access to a commuter flexible-spending account (which allows for tax deductions) or offering a monthly stipend, you're sure to retain employees who otherwise might have been forced to find jobs closer to home. Cultural perks: Providing rewards including tickets for concerts, movies, and sporting events is a great incentive program. Presenting the tickets in the form of contests and challenges is a great way to boost employee productivity and morale. Encourage breaks: Create a room for employees to take short breaks. Provide a massage chair as well as mats for meditation or yoga. Employees will return revitalized and ready to dive back into their work. Fitness stipends: Offering employees a monthly stipend for gym memberships, yoga classes or other fitness activities benefits everyone. Healthier employees are generally happier and more productive. Additionally, you'll lower your insurance costs and see a reduction in sick days. Flex time: These days, many employees find themselves checking email first thing in the morning or finishing a project late into the evening. A nice way to compensate for this extra effort is through providing flexibility in employee work hours. Free food: Because everyone needs to eat, food is a universally loved benefit. It's fairly inexpensive to stock your office kitchen with healthy, convenient snacks and drinks, and it's also good to treat your staff to catered breakfast or lunch meetings on occasion. Paid volunteer time: Offer to pay your employees regular wages (up to a certain number of hours) while they are volunteering and helping their community. Promote from within: By promoting employees within the company, you boost morale and sustain a motivated, productive workplace environment because your employees will think about their work as a career rather than a job. Summer hours: Closing the office early on Fridays during the summer lets everyone beat the heat as well as the traffic. Telecommuting: Allowing employees to occasionally work from home (or on a set schedule) will increase productivity and appreciation. Tuition reimbursement: Offer to pay a percentage of your employees' tuition for positions that are difficult to fill (and appropriate for recent grads). Unlimited vacation time: Many of today's fast-growing companies, including Netflix, Groupon and Zynga, have adopted unlimited vacation policies. Letting your employees decide how much vacation time can actually motivate them to work harder because you're demonstrating that you trust them to manage their time and complete their work. Bottom Line: While these perks can bolster morale, create a loyal workforce and increase productivity, it is important to remember that every workplace is different. Thus, the most valuable benefits will vary from company to company, depending on employees' specific needs. When you're deciding which benefits to offer your staff, consider the company's culture, your employees goals and needs, and the impact these perks will have on your business as a whole.